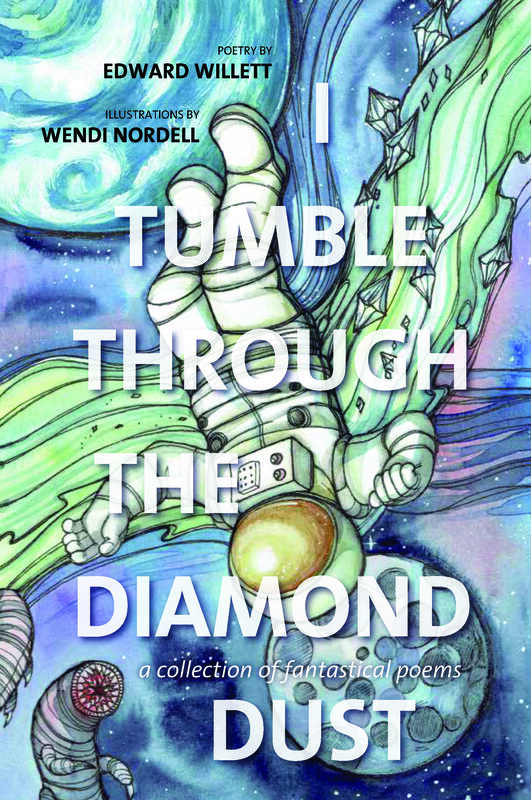 I Tumble through the Diamond Dust, my new collection of fantastical (science fiction, fantasy, and horror) poems, illustrated by Alberta artist Wendi Nordell (my talented niece), is now available in both print and ebook formats! Buy it from Amazon.ca, Amazon.com, Kobo, or the Apple store in ebook format, or in print through Chapters/Indigo or the publisher, Your Nickel’s Worth Press. Within these pages lie twenty-one poems… and twenty-one worlds: worlds in the farthest reaches of space, worlds steeped in myth and legend, worlds that never were, and worlds that yet could be. Written by award-winning science fiction and fantasy author Edward Willet, and beautifully illustrated by Alberta artist Wendy Nordell, each poem was inspired by— and contains– two lines of published poetry from Saskatchewan poets, sent out every weekday by former Saskatchewan Poet Laureate Gerald Hill as a Poetry Month challenge to members of the Saskatchewan Writers Guild in April 2016. Every poem tells a story. Some are frightening. Some are funny. Some are poignant, some surreal. Enter a realm of unfettered imagination… and embrace the fantastical. Tentative plans are for a book launch the first weekend in June. Whatever happens with that, Wendi and I will both definitely be on hand for a book signing at Chapters Regina the afternoon of June 2. I’m also working on some sort of launch event/reading/signing in Saskatoon at McNally Robinson. Stay tuned!